Howdy, you may have seen mention of me on this blog and on our facebook page but this is my first official post for the ASWT project. I introduced myself at the beginning of the season, but to refresh I am one of the three interns on the Eagle Nest Canyon 2015 Expedition. My previous archaeology work has been primarily with the National Park Service and Forest Service, neither of which generally have the resources to undertake studies such as this one. This is the first in-depth archaeological excavation I have worked on and I’ve been blown away by the site itself, the other expedition members and the leadership overseeing the project, and our numerous collaborators who contribute their specialized expertise on various and sundry sub-disciplines (chemistry, botany, entomology, geology…the list goes on). It seems that there are infinite directions that project-related studies could go. I love interdisciplinary research and so I’ve been especially taken with the subject on which I am blogging. 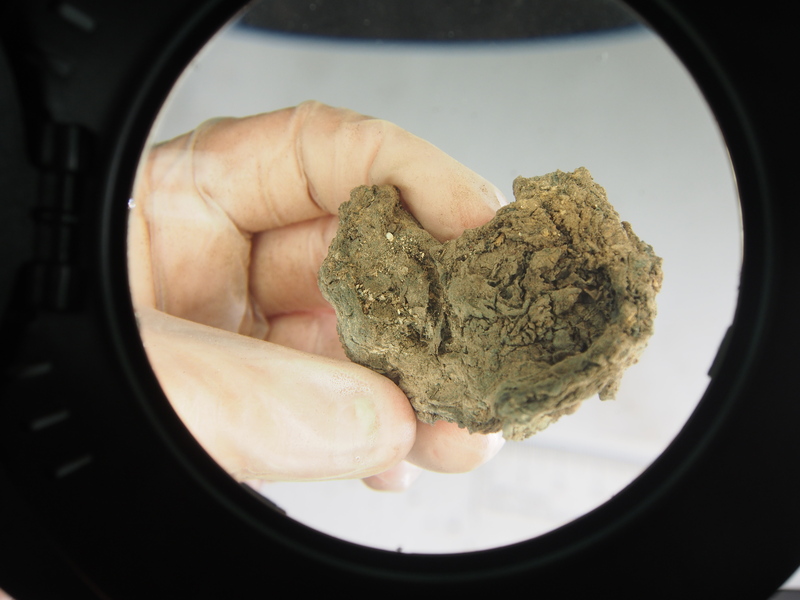 These delicate resources contain a world of information inside them- I’m glad to introduce the coprolites of Eagle Cave! Me, poofing sediments off a coprolite. I’m wearing a dust mask to protect my airway from the fine particles we stir up. 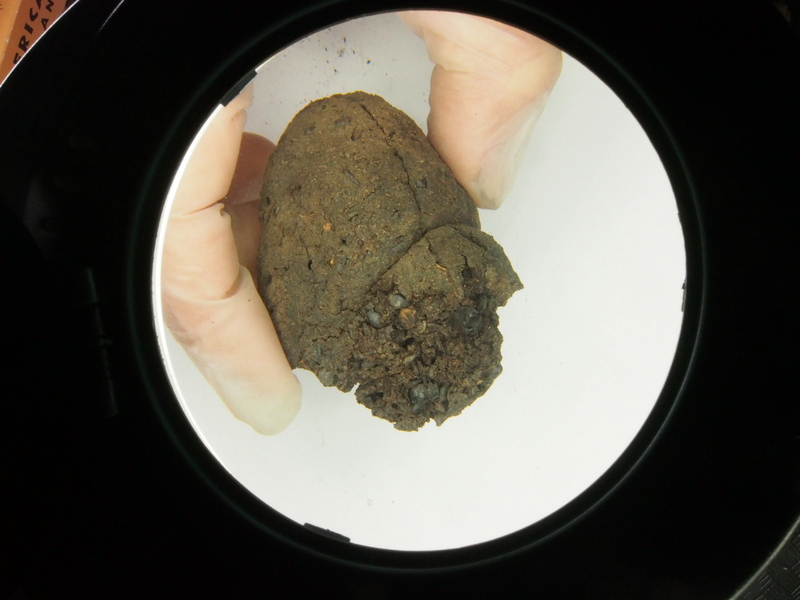 The study of human coprolites, also known as paleofeces, palaeofaeces, or simply dried-up old poop, was not regarded as important by the archaeological community until the mid-20th century. Now we realize that we have a lot to learn from coprolites; they can inform us on past diets and ecosystems, the health of an individual, and the manner in which one ate and pooped. Archaeologists can look at the plant and animal macrofossils (visible undigested remains), tiny pollen grains, phytoliths (micro-structures created by plants), viruses, parasites, and even bugs found in coprolites! 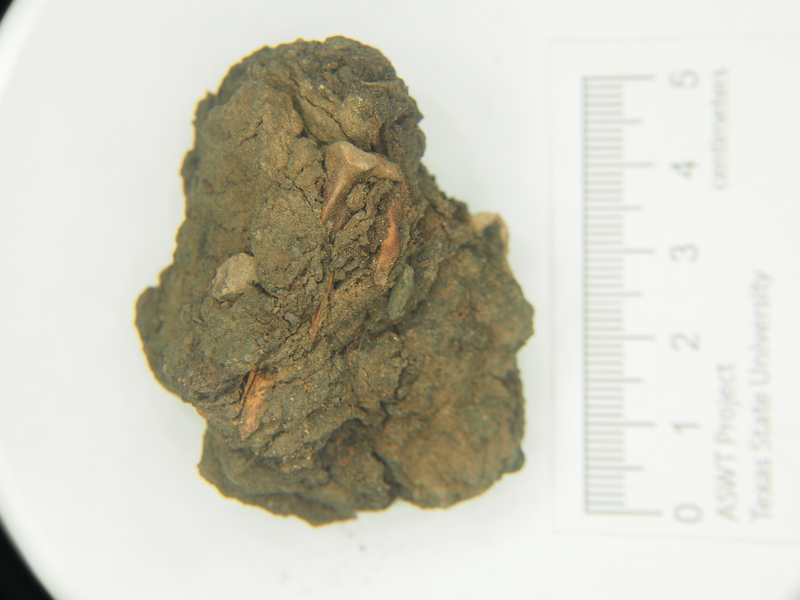 Further, coprolites can be directly radiocarbon dated (so we can determine how old they are) and they preserve not only the DNA of the person who made the deposit, but also the DNA of the animals and plants that were consumed. Though perhaps less revealing, shape, color and of course location of the deposit are relevant. The study of odor, though noted by many researchers, has as yet not proved of scientific value. FN31041 from Eagle Cave. We give each coprolite a unique specimen ID or Field Number (FN). We’ve found that one specimen can be made up of several segments representing one bowel movement. Victoria excavating a coprolite. After documentation and careful extraction we transport the coprolites to the lab in boxes or by hand so that they are not inadvertently crushed in our packs. Though I hesitate to mention paleontology- the oft confused (with archaeology) but unrelated study of dinosaurs- the study of dinosaur coprolites pre-dates the study of human. We are indebted to paleontologists for first recognizing the potential in coprolite study. The word coprolite, derived from Greek, was termed in the 1830s by an English paleontologist and translates to “dung stone.” I have yet to hear about human coprolites that have turned to stone, nonetheless the use of the word coprolite to describe human feces in an archaeological context is pervasive. The Lower Pecos Canyonlands is famous for its coprolite studies, specifically those conducted on specimens excavated from Hinds Cave. 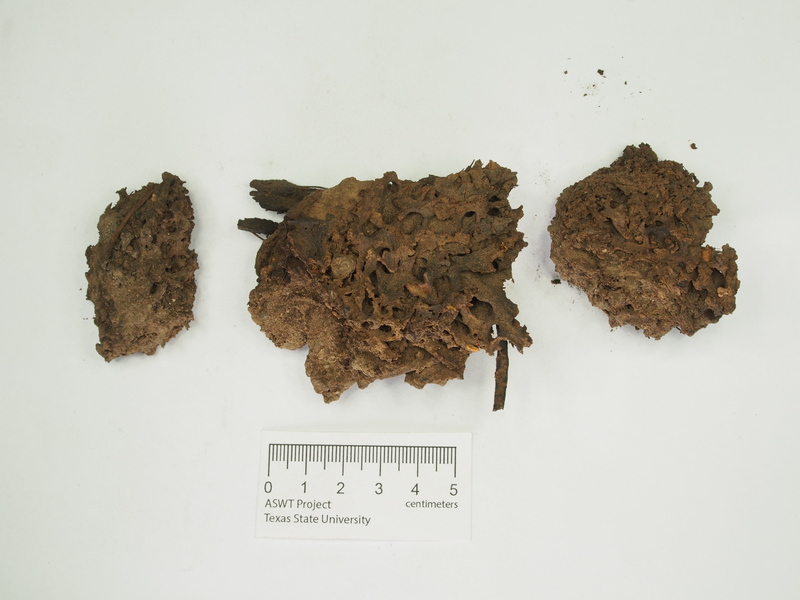 Coprolites have been identified at other sites in the region but none have been so well studied as those from Hinds. Profile of latrine deposit in Hinds Cave. Coprolites are in the upper right corner. Photo from texasbeyondhistory.net. 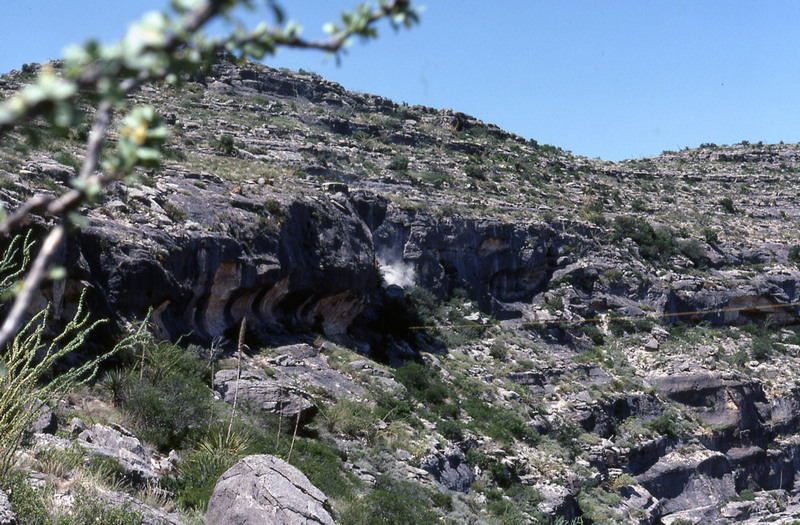 Hinds Cave is north of Eagle Cave, along the Pecos River. 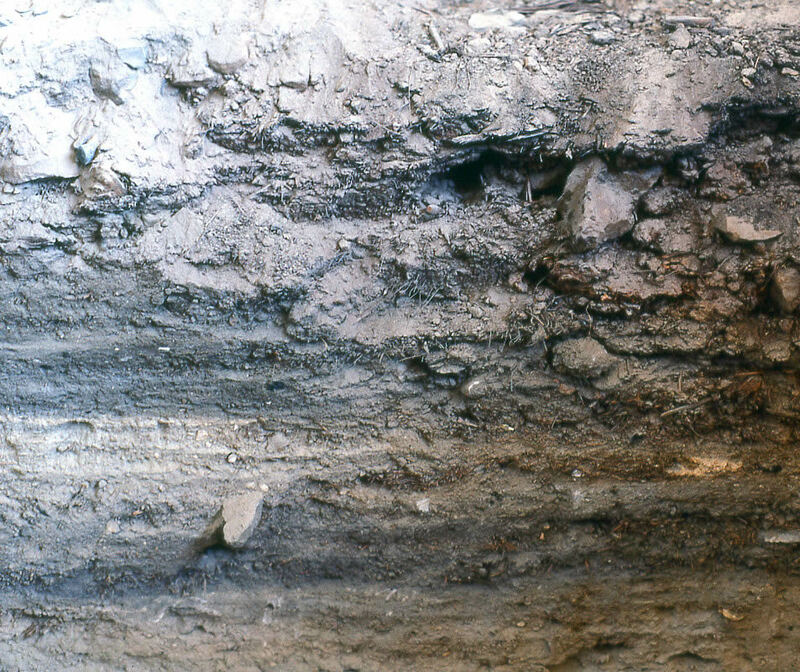 This photo from texasbeyondhistory.net was taken during the 1970s excavation, as evidenced by the excavation dust swirling from the rockshelter. 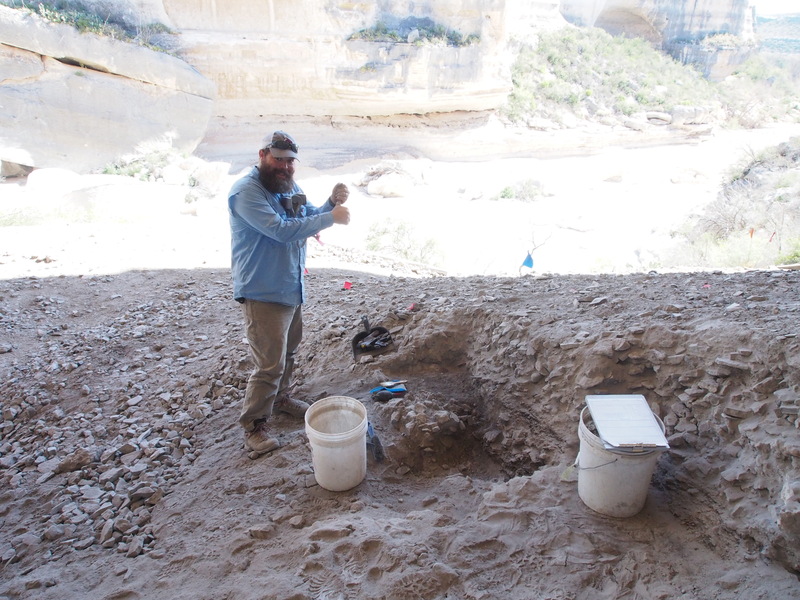 Even knowing that coprolites preserve well in the Lower Pecos we didn’t really expect to find them in Eagle Cave – coprolites were not found during the 2014 field season in any of the shelters investigated in Eagle Nest Canyon. 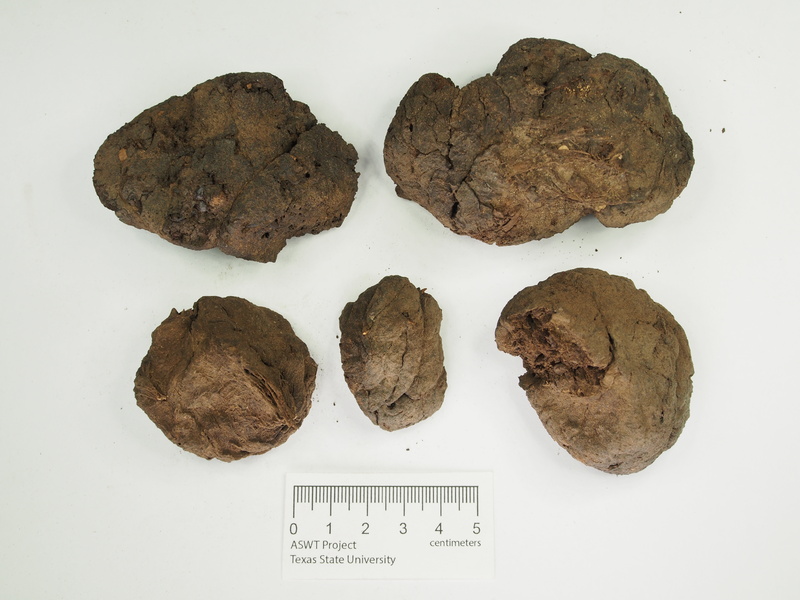 Happily, during our excavations this spring we were excited to find an abundance of well preserved coprolites! Thus far over 80 coprolite specimens have been inventoried during this field season, the vast majority of them excavated from near the front of the rockshelter and approximately a meter or two below the surface. South Trench Profile of Eagle Cave with coprolites plotted- click on the image to enlarge. Matt “Call me John” Larsen, pictured here saying “poop” in American Sign Language, was the first to start finding coprolites in the fiber layers near the front of the shelter. 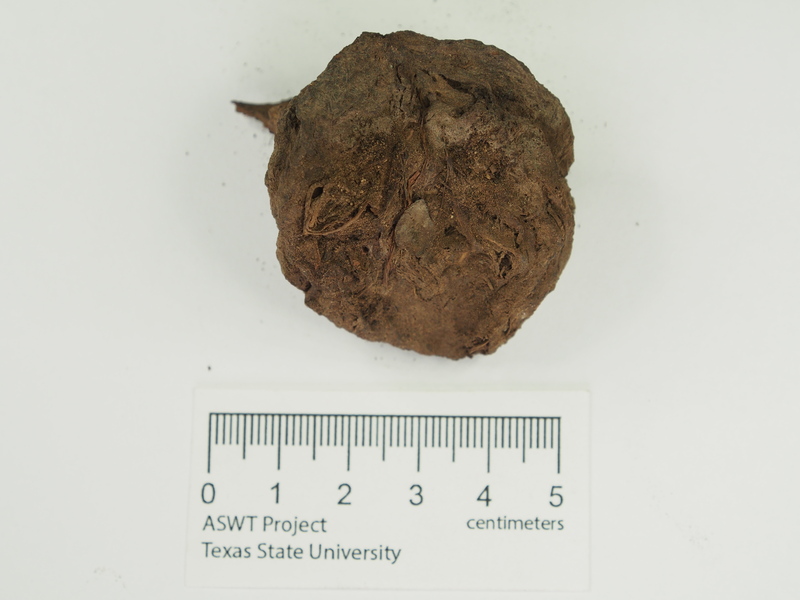 Shape- It has been found that plump, shapely coprolites are often from a fiber/plant-heavy meal while the “loose” ones may be from an individual who had recently consumed a lot of meat. There are, however, many other reasons that one could have had fluid bowel movements: parasites, water containing algae-born toxins, plants with a laxative effect (sotol and lechuguilla – both baked in earth ovens – are known to have this effect on some people), even emotional states- fear has been cited- can cause diarrhea. The “most-shapely” and largest of our specimens, and a good example of a segmented bowel movement: FN30984. FN31296 fell a little flat. Size is affected by several conditions, including length of time since the last bowel movement and types of food eaten. Meals based on a single type of food can result in smaller stools, though a vegetarian diet can result in a larger stool than an omnivorous diet. Diminutive FN31109. Compare it to FN30984 pictured above. FN31048 is unusually orange in color. FN31103 appears greyish, though it is important to note that our specimens still have sediment from excavation clinging to them. FN31063 has a warm brown color, and lots of fibers. Macrobotanicals, bones and fur (Macrofossils): Botanists and faunal experts can identify large plant and animal remains within coprolites. Thorough analysis requires breaking down the coprolite and separating it into constituent parts, however, macrofossils are sometimes visible on the surface. Many thanks to our faunal and botanical associates- Christopher Jurgens, Haley Rush, Kevin Hanselka, Leslie Bush, and Phil Dering- for helping to tentatively identify bones and seeds in a couple specimens (meet our zooarcheology and archeobotany heros here: “Come Visit:” A Zoooarchaeologist Is Lured Back to the Lower Pecos and here:The Archaeobotanical Team Forms). The diamond-shaped macrofossil in the center of this stool has been identified as a mesquite endocarp. The peak sticking off the backside are fibers from a plant such as lechuguilla or sotol. FN30984 is full of seeds! FN30983 contains what looks like prickly pear seeds, the tastiest desert food I’ve ever eaten (unless you count mesquite snickerdoodles). Holey crap- I believe insects created this swiss cheese effect in FN31021. One morning I resumed excavation of a coprolite I hadn’t finished exposing the previous day. When dusting off the specimen this beetle crawled out from under it! 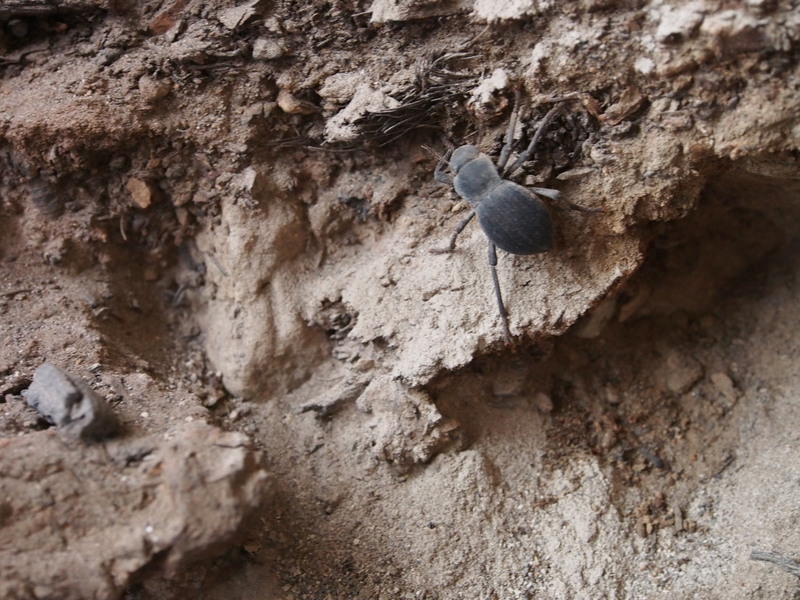 Perhaps coprophagous (dung-eating) insects are interested in vintage as well as fresh specimens. As mentioned previously, there are numerous other avenues for coprolite study (e.g., pollen, DNA/genetics, phytoliths, lipids, parasitism, general health, dietary nutrition, seasonality, medicine, food processing techniques, past environment, food trade/exchange, and food storage), but until we begin the analysis of the Eagle Cave specimens I cannot go into great detail. 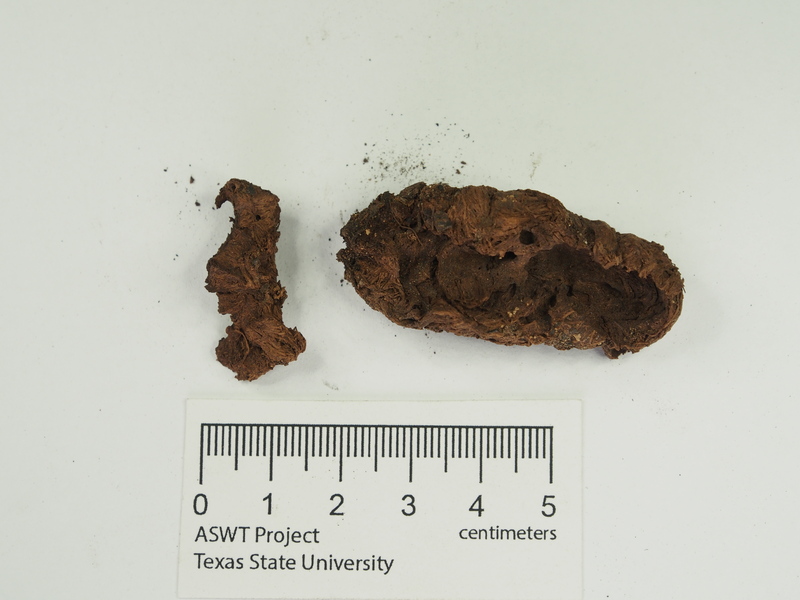 However, I can provide a brief synopsis (definitely not exhaustive) of some things archaeologists have learned from conducting coprolite studies in the Lower Pecos. Let us start at the beginning of the digestive system: the mouth. A significant malady affecting ancient Lower Pecos people was dental wear and eventual complete toothlessness by their 40s. Danielson and Reinhard (1998) studied coprolites to examine possible causes for the dental wear and tooth loss in Archaic-age Lower Pecos skeletons. They considered several hypotheses, including that the grit from food-processing stones was wearing down the tooth enamel. 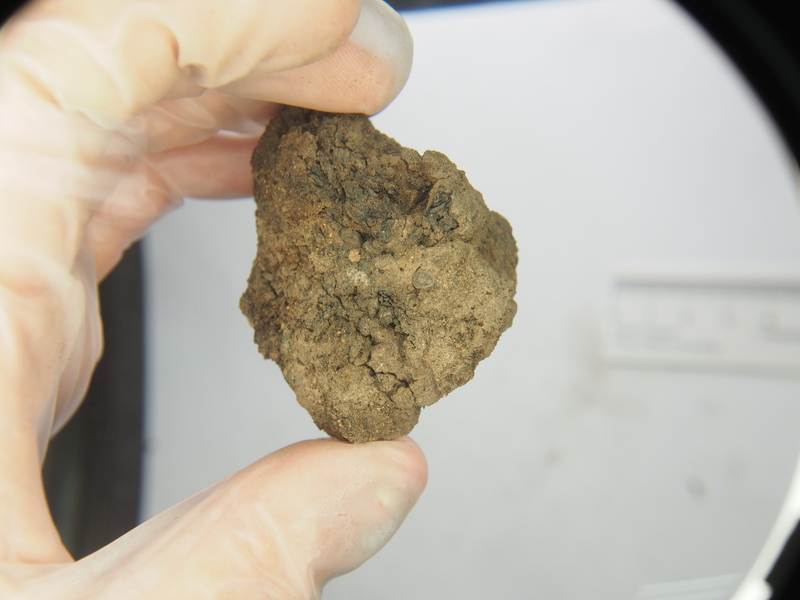 Interestingly, they found no such grit in the coprolites they studied. 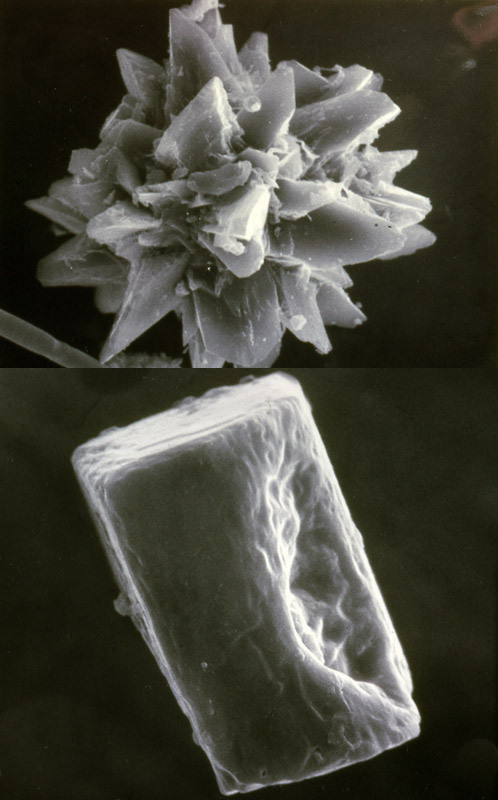 Rather, calcium oxalate phytoliths (microscopic structures found in certain plants which pass unscathed through the digestive system) are found in abundance in Lower Pecos coprolites. They occur in the agave and cactus plant families (Agavaceae and Cactaceae respectively), and were found to be harder than tooth enamel. Not coincidentally, agave and cactus are a major part of the aboriginal diet of the Lower Pecos people. Other factors probably contributed to dental wear and loss, but a major cause was identified. The phytolith pictured up top is prickly pear. The lower is a sotol phytolith (texasbeyondhistory.net). So, we have a population of largely toothless people who still must eat. But, must they chew? Specimen FN30984 from Eagle Cave, and some found at other sites, indicate there was not always much chewing – what Dr. Black charmingly calls the “grab it and gulp” method of eating. That brings us to what they were ingesting. Certainly food availability varies with the seasons and the millennia, but there is coprolite evidence people were eating many of the same foods that are available today (e.g., sotol, lechuguilla, cattail, wild onion, prickly pear, insects, fish, deer, pronghorn, rodents, reptiles, bison [the kitchen ran out of that a few years ago], and too many other foods and medicinal plants to go into at this time – check out the TBH exhibit on the Ethnobotany of the Lower Pecos Canyonlands for more information about Lower Pecos diet. So far we have only been able to identify a few different seeds in the Eagle Cave coprolites but as we begin detailed analysis of the coprolites we will learn a great deal more. Finally, when the meal is ready to be passed a decision has to be made on where to release the body’s effluent. I don’t know if there are enough sites in the region with mapped coprolite “deposits” to make assertions about latrine location preferences, but it was found that the latrine at Hinds Cave was at the back of the shelter. 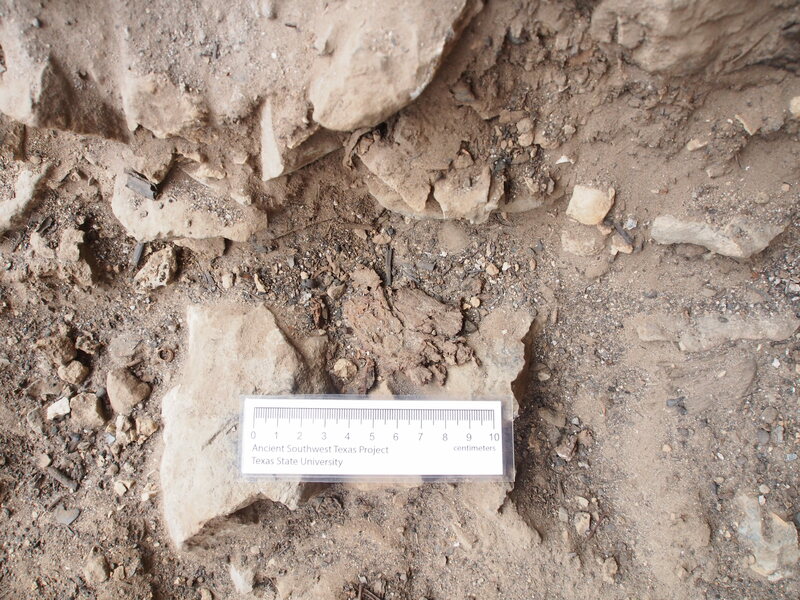 The vast majority of coprolites from Eagle Cave have been collected from near the front of the shelter at the top of the burned-rock-strewn talus slope. 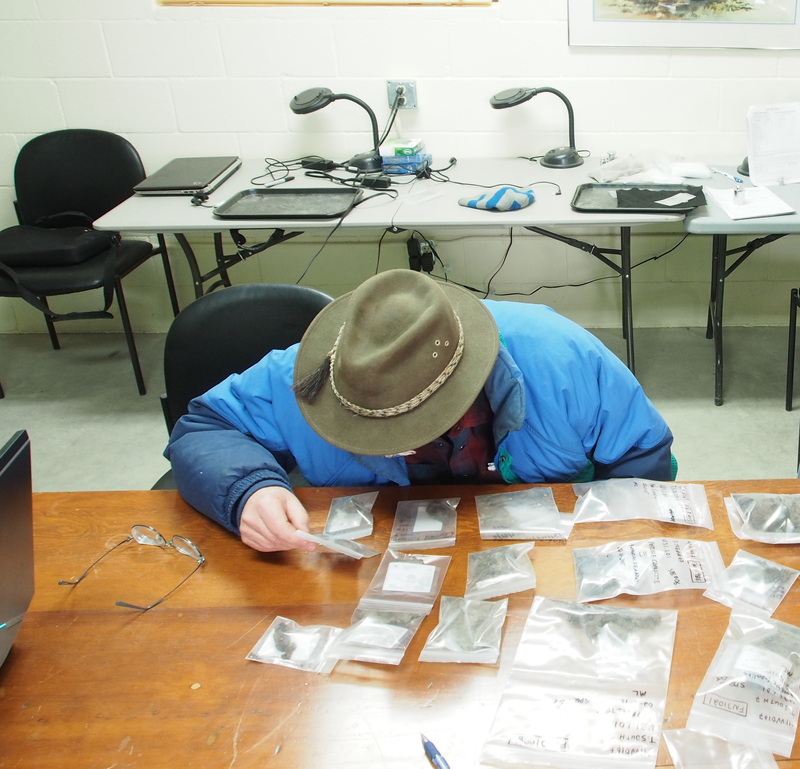 Dr. Black takes a close look at the Eagle Cave coprolite collection. 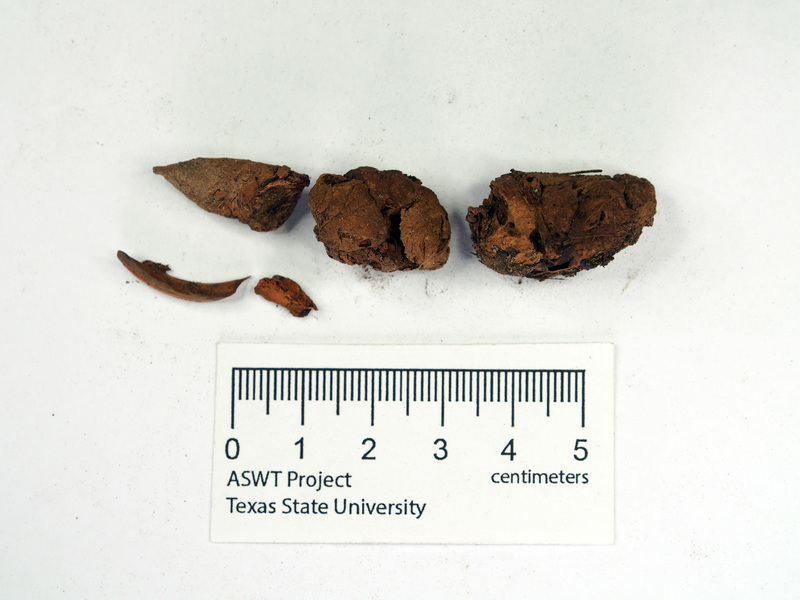 For more discussion about coprolites from the Lower Pecos and Hinds Cave, check out the TBH exhibit on Hinds Cave to learn more. 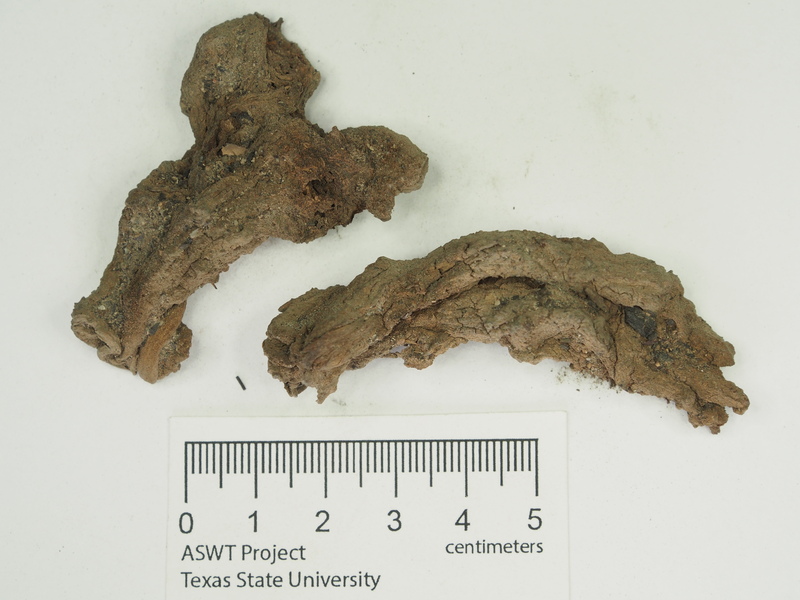 So much more on coprolites could (and will) be written, but right now other doodies call! Danielson, Dennis R. and Karl J. Reinhard 1998 Human dental microwear caused by calcium oxalate phytoliths in prehistoric diet of the lower Pecos region, Texas. American Journal of Physical Anthropology 107: 297-304. Williams-Dean, Glenna 1978 Ethnobotany and cultural ecology of prehistoric man of southwest Texas. 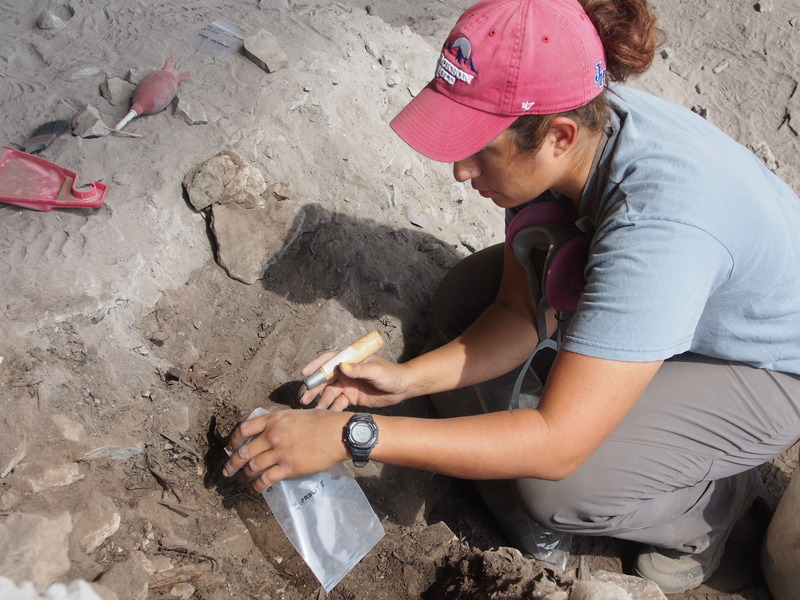 Ph.D. Dissertation, Department of Anthropology, Texas A&M University, College Station. 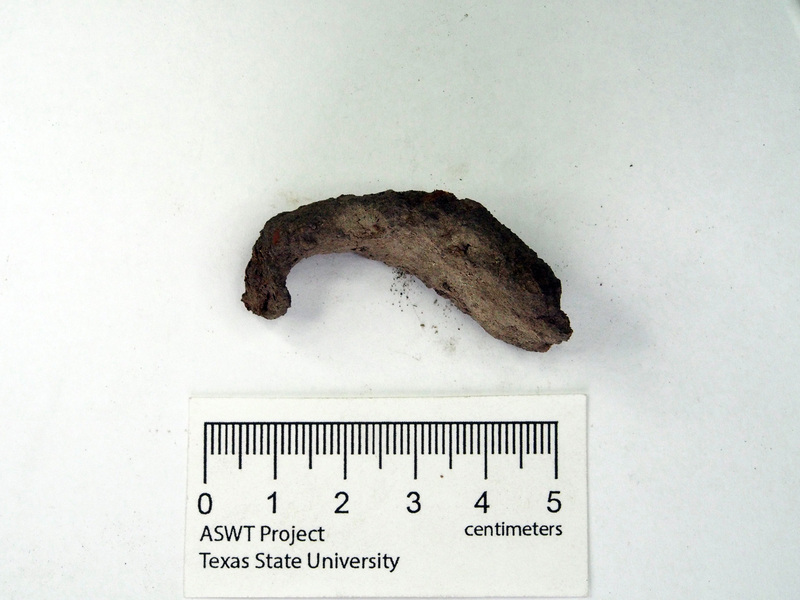 This entry was posted in Archaeoentomology, Coprolites, Eagle Cave, Paleoethnobotany, Spring ENC 2015 Posts, Zooarchaeology. Bookmark the permalink. If the prickly pear seeds are the tastiest desert foods you have eaten – you need to explore the gustatory potential of the region more. Interesting post. Do you know a man named Karl Reinhard? Certainly a unique aspect of your profession – too bad “What’s My Line?” is no longer around; you’d baffle everyone with this particular project. Nice to catch up with you online…wish I could do so in person!